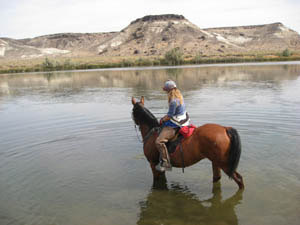 It will take place here next weekend - the 3-day Owyhee Fandango endurance ride. 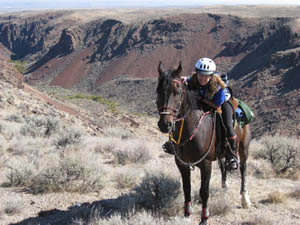 "Our goal is to bring riders together to ride historic trails in America's 'Wild West', to build friendships and International camaraderie, and to experience it all on horseback. Ride a relaxed pace - or a competitive race, for 50 miles, 100 miles, or 150 miles ... Any way you want it! " 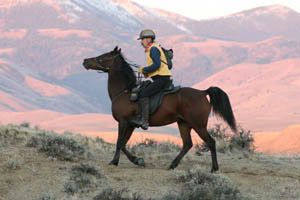 There are also trail rides of 10 or 15 miles for those folks who prefer that. John and Steph are finishing putting ribbons out on trails. 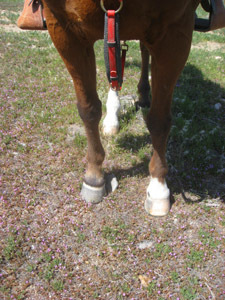 I'm ribboning a portion of trail on foot (I won't do 4-wheelers on trails any more, after I rolled one!). 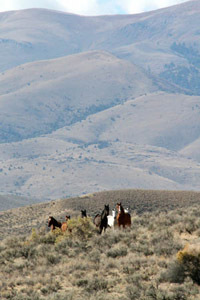 Carol and I hung colorful OWYHEE RIDE signs up on the highway today, pointing the way to base camp. Steph's pulling weeds, planting flowers, mowing and watering the lawn. Dudley's trying to lose a little more weight so he looks really good in his dappled coat. John the radio guy was here, coordinating times with Steph so he can get his volunteer crew of 15 set up at the right places and the right times on the ride days. If you want to pick up a little education while you're here, there's the USEF "education session" for riders, and there's a hoofcare clinic to attend. If you want socializing, there's the Wine and Cheese Social Friday evening sponsored by Vettec, not to mention the nightly meals (during the awards) cooked by Blue Moon Catering. 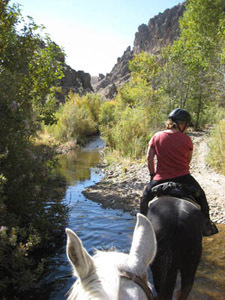 Of course, the BEST reason to come is to ride our Owyhee trails. 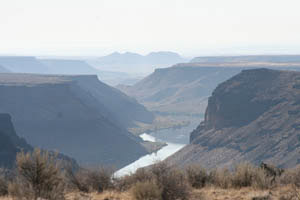 The scenery is quite picturesque: high desert country with hills and draws and hidden canyons and washes; a loop around Wild Horse Butte and along the Snake River; a vet check at the Sierra Del Rio ranch - formerly the Nahas Ranch which was an original stop on the Oregon trail where you could water your horses in the Snake River; Hart Creek Canyon and an old homestead; all with the snow-covered Owyhee Mountains to the southwest framing the whole shebang. Any season the scenery is awesome, but this spring we've got a good helping of green grass (green for the desert, anyway), and a big variety of wildflowers, with new ones popping out every week. Globemallow just came yesterday. There's also monkshood, lupine, buckwheat, purple sage, asters and plenty others I don't know. The green carpet is already edging towards brown, and it's quickly getting dry, so if we don't get another shower this week (not in the forecast) it will be browner and dusty. The flowers will still be around for a while, however. You'll see and hear a variety of birds during the day - Ravens, red-tailed hawks, kestrels, magpies, killdeer, bright yellow goldfinches, red-winged blackbirds, and if you're lucky, a golden eagle or two in the desert canyons, or maybe a bald eagle near the Snake River. In the morning you'll probably hear downy woodpeckers hammering away and if you're lucky, at night you might hear (or see, if you're very lucky) a family of screech owls (two parents and two babies). 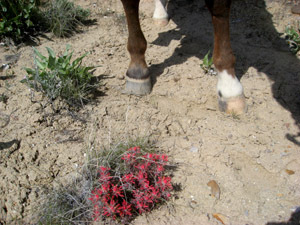 But don't forget this is the Wild West: keep your eyes peeled for rattlesnakes. I came upon the first one of the season today while out marking trail, leading Dudley on foot. Yikes! Thereafter I was very jumpy, leaping in the air any time a bird flew out of bush or a sagebrush rattled when I brushed against it. There's also peril in the scattered Death Camas - they look a bit like wild onions, but don't be fooled and taste them like I almost did! 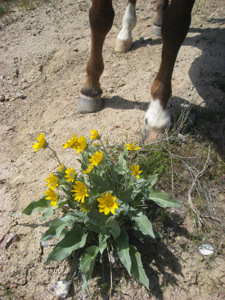 All parts of the plant are poisonous for you or your horse. 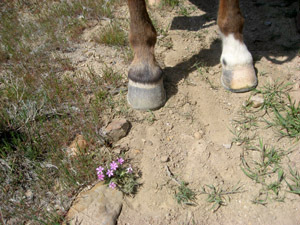 We've seen a bit of locoweed around, though your horse would have to chow down on it for a while before he started doing cartwheels. But that's just a little part of the Wild West experience.